An official 2013 ANS satellite meeting, BioAutism 2013 will focus on the neural and biological basis of autism spectrum disorders (ASD). It is estimated that 1 in 100 children are diagnosed with an autism spectrum disorder each year. While the causes of autism are not clear, in recent years significant progress has been made towards unraveling the underlying disease etiology and candidate mechanisms. The aim of this meeting is to bring together researchers working on autism spectrum disorders from multiple disciplines, with the specific goal to consider how basic and clinical research can accelerate therapies and treatments. Topics to be discussed include genetics, synaptic and circuit level mechanisms, cognitive mechanisms, animal models, moving from models and mechanisms to therapeutics. The organisers include: Dr Elisa Hill (Uni Melb), A.Prof Tony Hannan (Florey/Uni Melb), Dr Naomi Bishop (La Trobe), Dr Randal Moldrich (UQ) and Dennis Crowley. Dr Ricardo Dolmetsch (Stanford University, CA, USA): Synaptic function and autism. A full program will be available closer to the day of the event. Thanks to the generosity of our principal sponsors, University of Melbourne and Florey Neurosciences Institute, there will be no fee for registration. and whether your have any special dietary requirements. Registrations will be accepted up until the close of business, Friday January 18 2013. Despite being a scientific meeting, the organising committee is keen to have distinguished and interested members of the community attend. 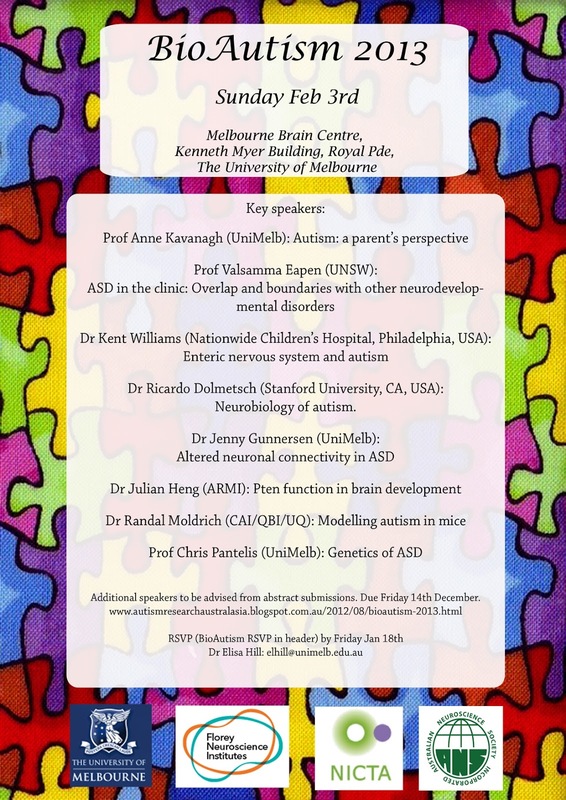 To register your interest, please email the local organiser Dr Hill (elhill@unimelb.edu.au). Poster presentations are welcomed from registrants. Maximum poster size will be 1m wide x 1.4m long. Ongoing and recruiting studies, and registered trials, are welcomed. Abstract acceptance will be based on scientific quality. Oral presentations will be offered to some selected and accepted abstracts. Abstracts should be submitted to elhill@unimelb.edu.au Please indicate if you wish to be considered for an oral presentation.